PunditFact, a related site that was also created by the Times' editors, is devoted to fact-checking claims made by political pundits. Both PolitiFact and PunditFact were funded primarily by the Tampa Bay Times and ad revenues generated on the website until 2018, and the Times continues to sell ads for the site now that it is part of Poynter, a non-profit organization that also owns the newspaper. PolitiFact increasingly relies on grants from several nonpartisan organizations, and in 2017 launched a membership campaign and began accepting donations from readers. In addition to political claims, the site monitors the progress elected officials make on their campaign promises, including a "Trump-O-Meter" for President Donald Trump and an "Obameter" for President Barack Obama. PolitiFact.com's local affiliates review promises by elected officials of regional relevance, as evidenced by PolitiFact Tennessee's "Haslam-O-Meter" tracking Tennessee Governor Bill Haslam's efforts and Wisconsin's "Walk-O-Meter" tracking Wisconsin Governor Scott Walker's efforts. PolitiFact has won several awards, and has been both praised and criticized by independent observers, conservatives and liberals alike. Both liberal and conservative bias have been alleged at different points, and criticisms have been made that PolitiFact attempts to fact-check statements that cannot be truly "fact-checked". PolitiFact.com was started in August 2007 by Times Washington Bureau Chief Bill Adair, in conjunction with the Congressional Quarterly. In January 2010, PolitiFact.com expanded to its second newspaper, the Cox Enterprises –owned Austin American-Statesman in Austin, Texas; the feature, called PolitiFact Texas, covers issues that are relevant to Texas and the Austin area. 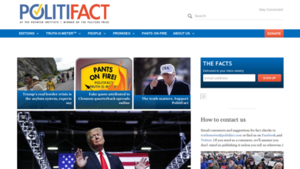 Since then, PolitiFact.com expanded to other papers, such as The Atlanta Journal-Constitution, The Providence Journal, Milwaukee Journal Sentinel, The Plain Dealer, Richmond Times-Dispatch, the Knoxville News Sentinel and The Oregonian. The Knoxville News Sentinel ended its relationship with PolitiFact.com after 2012. In 2013, Adair was named Knight Professor of the Practice of Journalism and Public Policy at Duke University, and stepped down as Bureau Chief at the Times and as editor at PolitiFact.com. The Tampa Bay Times' senior reporter, Alex Leary, succeeded Bill Adair as Bureau Chief on July 1, 2013, and Angie Drobnic Holan was appointed editor of PolitiFact in October 2013. Adair remains a PolitiFact.com contributing editor. In 2014, The Plain Dealer ended its partnership with PolitiFact.com after they reduced their news staff and were unwilling to meet "the required several PolitiFact investigations per week". The organization was acquired in February 2018 by the Poynter Institute, a non-profit journalism education and news media research center that also owns the Tampa Bay Times. In December 2009, they declared the Lie of the Year to be Sarah Palin's assertion that the Patient Protection and Affordable Care Act of 2009 would lead to government "death panels" that dictated which types of patients would receive treatment. In December 2010, PolitiFact.com dubbed the Lie of the Year to be the contention among some opponents of the Patient Protection and Affordable Care Act that it represented a "government takeover of healthcare". PolitiFact.com argued that this was not the case, since all health care and insurance would remain in the hands of private companies. PolitiFact's Lie of the Year for 2011 was a statement by the Democratic Congressional Campaign Committee (DCCC) that a 2011 budget proposal by Congressman Paul Ryan, entitled The Path to Prosperity and voted for overwhelmingly by Republicans in the House and Senate, meant that "Republicans voted to end Medicare". PolitiFact determined that, though the Republican plan would make significant changes to Medicare, it would not end it. PolitiFact had originally labeled nine similar statements as "false" or "pants on fire" since April 2011. For 2012, PolitiFact chose the claim made by Republican presidential candidate Mitt Romney that President Obama "sold Chrysler to Italians who are going to build Jeeps in China" at the cost of American jobs. (The "Italians" in the quote was a reference to Fiat, who had purchased a majority share of Chrysler in 2011 after a U.S. government bailout of Chrysler.) PolitiFact had rated the claim "Pants on Fire" in October. PolitiFact's assessment quoted a Chrysler spokesman who had said, "Jeep has no intention of shifting production of its Jeep models out of North America to China." As of 2016, 96.7 percent of Jeeps sold in the U.S were assembled in the U.S., with roughly 70 percent North American parts content. (The vehicle with the most North American parts content came in at 75%). PolitiFact's 2014 Lie of the Year was "Exaggerations about Ebola", referring to 16 separate statements made by various commentators and politicians about the Ebola virus being "easy to catch, that illegal immigrants may be carrying the virus across the southern border, that it was all part of a government or corporate conspiracy". These claims were made in the midst of the Ebola virus epidemic in West Africa when four cases were diagnosed in the United States in travelers from West Africa and nurses who treated them. PolitiFact wrote, "The claims – all wrong – distorted the debate about a serious public health issue." PolitiFact's 2015 Lie of the Year was the "various statements" made by 2016 Republican presidential candidate Donald Trump. Politifact found that 76% of Trump's statements that they reviewed were rated "Mostly False," "False" or "Pants on Fire". Statements that were rated "Pants on Fire" included his assertion that the Mexican government sends "the bad ones over" the border into the United States, and his claim that he saw "thousands and thousands" of people cheering the collapse of the World Trade Center on 9/11. PolitiFact's 2016 Lie of the Year was "fake news" referring to fabricated news stories including the Pizzagate conspiracy theory. PolitiFact's 2017 Lie of the Year was Donald Trump's claim that Russian election interference is a "made-up story." The annual poll found 56.36% of the 5080 respondents agreed that Trump's "Pants on Fire" statement deserved the distinction. Raul Labrador's statement that " Nobody dies because they don't have access to health care," and Sean Spicer's statement that "[Trump's audience] was the largest audience to witness an inauguration, period," came in second and third place getting 14.47% and 14.25% of the vote respectively. In its article, PolitiFact points to multiple occasions where Donald Trump stated that Russia had not interfered with the election despite multiple government agencies claiming otherwise. PolitiFact.com was awarded the Pulitzer Prize for National Reporting in 2009 for "its fact-checking initiative during the 2008 presidential campaign that used probing reporters and the power of the World Wide Web to examine more than 750 political claims, separating rhetoric from truth to enlighten voters". A Wall Street Journal opinion editorial by Joseph Rago in December 2010 called PolitiFact "part of a larger journalistic trend that seeks to recast all political debates as matters of lies, misinformation and 'facts,' rather than differences of world view or principles". TV critic James Poniewozik at Time characterized PolitiFact as having the "hard-earned and important position as referee in the mudslinging contest—a 'truth vigilante,' as it were", and "PolitiFact is trying to do the right thing here. And despite the efforts of partisans to work the refs by complaining about various calls they’ve made in the past, they’re generally doing a hard, important thing well. They often do it better than the rest of the political media, and the political press owes them for doing it." Poniewozik also suggested, "they need to improve their rating system, to address the irresponsible, the unprovable, the dubious. Otherwise, they’re doing exactly what they were founded to stop: using language to spread false impressions." Mark Hemingway of The Weekly Standard criticized all fact-checking projects by news organizations, including PolitiFact, the Associated Press and the Washington Post, writing that they "aren't about checking facts so much as they are about a rearguard action to keep inconvenient truths out of the conversation". In February 2011, University of Minnesota political science professor Eric Ostermeier analyzed 511 PolitiFact stories issued from January 2010 through January 2011. He found that the number of statements analyzed from Republicans and from Democrats was comparable, but Republicans have been assigned substantially harsher grades, receiving 'false' or 'pants on fire' more than three times as often as Democrats. Ostermeier suggested that this may indicate a bias in the selection of statements to analyze, concluding: "The question is not whether PolitiFact will ultimately convert skeptics on the right that they do not have ulterior motives in the selection of what statements are rated, but whether the organization can give a convincing argument that either a) Republicans in fact do lie much more than Democrats, or b) if they do not, that it is immaterial that PolitiFact covers political discourse with a frame that suggests this is the case." PolitiFact editor Bill Adair responded in MinnPost: "Eric Ostermeier's study is particularly timely because we've heard a lot of charges this week that we are biased—from liberals [...] So we're accustomed to hearing strong reactions from people on both ends of the political spectrum. We are a news organization and we choose which facts to check based on news judgment." In December 2011, Northeastern University journalism professor Dan Kennedy wrote in the Huffington Post that the problem with fact-checking projects was "there are only a finite number of statements that can be subjected to thumbs-up/thumbs-down fact-checking". Matt Welch, in the February 2013 issue of Reason magazine, criticized PolitiFact and other media fact-checkers for focusing much more on statements by politicians about their opponents, rather than statements by politicians and government officials about their own policies, thus serving as "a check on the exercise of rhetoric" but not "a check on the exercise of power". ^ "Politifact.com Site Info". Alexa Internet. Archived from the original on March 5, 2016. Retrieved April 1, 2014. ^ "PolitiFact.com". St. Petersburg Times. Archived from the original on August 15, 2010. Retrieved August 16, 2010. ^ Adair, Bill. "Principles of PolitiFact, PunditFact and the Truth-O-Meter". PolitiFact. Archived from the original on April 18, 2014. Retrieved April 12, 2014. ^ "Who is PolitiFact? Who pays for PolitiFact?". PolitiFact. January 12, 2017. Archived from the original on May 29, 2017. Retrieved May 30, 2017. ^ "Haslam-O-Meter: Tracking the promises of Bill Haslam". PolitiFact Tennessee. Archived from the original on March 22, 2012. Retrieved March 19, 2012. ^ "Walk-O-Meter: Tracking the promises of Scott Walker". PolitiFact Wisconsin. Archived from the original on July 14, 2015. Retrieved July 14, 2015. ^ McElroy, Jack. "News Sentinel dropping out of PolitiFact". Knoxnews.com. The E.W. Scripps Co. Archived from the original on May 25, 2013. Retrieved April 16, 2014. ^ Diadiun, Ted. "Coming: Truth squad reporting without the gimmicks". Cleveland Plain Dealer. Northeast Ohio Media Group LLC. Archived from the original on April 13, 2014. Retrieved April 12, 2014. ^ "Poynter Expands Fact-Checking Franchise by Acquiring PolitiFact.com". February 12, 2018. Archived from the original on February 13, 2018. ^ "PolitiFact goes nonprofit, moves to Poynter Institute". PolitiFact. Retrieved August 22, 2018. ^ "Democrats say Republicans voted to end Medicare and charge seniors $12,000". PolitiFact. April 20, 2011. Archived from the original on December 12, 2011. Retrieved December 22, 2011. ^ a b Holan, Angie Drobnic (December 12, 2012). "Lie of the Year: the Romney campaign's ad on Jeeps made in China". PolitiFact. Archived from the original on December 12, 2012. Retrieved December 12, 2012. ^ Bunkley, Nick (July 21, 2011). "Government Sells Stake in Chrysler". The New York Times. Archived from the original on November 4, 2014. ^ "Mitt Romney says Obama's Chrysler deal undermined U.S. workers". PolitiFact. October 29, 2012. Archived from the original on December 8, 2012. Retrieved December 12, 2012. ^ "Jeep most American-made brand with nearly 97 percent of its vehicles born in the USA". KCTV5 News, Kansas City. June 28, 2016. Archived from the original on September 17, 2016. Retrieved September 7, 2016. ^ "15 Trucks, SUVs, and Vans With the Most North-American-Made Parts". Motor Trend. February 20, 2015. Archived from the original on September 4, 2016. Retrieved September 7, 2016. ^ a b Drobnic Holan, Angie (December 12, 2013). "Lie of the Year: 'If you like your health care plan, you can keep it'". PolitiFact.com. Archived from the original on December 13, 2013. Retrieved December 12, 2013. ^ Roy, Avik (December 27, 2013). "Pants On Fire: PolitiFact Tries To Hide That It Rated 'True' in 2008 Obamacare's 'Keep Your Health Plan' Promise". Forbes. Retrieved January 13, 2019. ^ Angie Drobnic Holan; Aaron Sharockman (December 15, 2014). "2014 Lie of the Year: Exaggerations about Ebola". PolitiFact. Archived from the original on October 25, 2017. ^ "PolitiFact's 2016 Lie of the Year: Fake news". Archived from the original on September 4, 2017. ^ "2017 Lie of the Year: Russian election action is a hoax". politifact.com. Archived from the original on March 21, 2018. Retrieved April 30, 2018. ^ "2017 Lie of the Year Readers' Poll results". politifact.com. Archived from the original on April 26, 2018. Retrieved April 30, 2018. ^ Holan, Angie Drobnic; Sherman, Amy (December 11, 2018). "PolitiFact's Lie of the Year: Online smear machine tries to take down Parkland students". politifact.com. Retrieved December 12, 2018. ^ The 2009 Pulitzer Prize Winners Archived September 19, 2009, at the Wayback Machine Retrieved August 16, 2010. ^ "PolitiFiction: True 'Lies' about Obamacare". The Wall Street Journal. December 23, 2010. Archived from the original on February 1, 2015. PolitiFact's decree is part of a larger journalistic trend that seeks to recast all political debates as matters of lies, misinformation and 'facts,' rather than differences of world view or principles. ... PolitiFact is run by the St. Petersburg Times and has marketed itself to other news organizations on the pretense of impartiality. ^ Poniewozik, James (August 8, 2012). "PolitiFact, Harry Reid's Pants, and the Limits of Fact-Checking". Time. Archived from the original on September 11, 2016. But if their rating system—designed, ironically, to abet the truth by making it as easy to spread via catchphrase as a lie—is sending false messages, then they need to improve their rating system, to address the irresponsible, the unprovable, the dubious. Otherwise, they’re doing exactly what they were founded to stop: using language to spread false impressions. You can tell them a guy told you that about them. ^ Ostermeier, Eric (February 10, 2011). "Selection Bias? PolitiFact Rates Republican Statements as False at 3 Times the Rate of Democrats". Smart Politics. Archived from the original on August 14, 2017. ^ Brauer, David (February 15, 2011). "Politifact responds to U researcher's anti-GOP bias claim". MinnPost. Archived from the original on April 2, 2015. Retrieved March 26, 2015. ^ PolitiFact and the Limits of Fact-Checking Archived March 17, 2012, at the Wayback Machine, Dan Kennedy, Huffington Post, December 13, 2011. ^ Welch, Matt (February 2013). "The 'Truth' Hurts: How the fact-checking press gives the president a pass". Reason. Archived from the original on January 20, 2013.